Stir fries | Retired? No one told me! It is quite difficult to think of what to suggest as when I worked in my last job although we had the heating on the doors were continually opening and closing so if you were working on the ground floor it was a tad cold most of the time so a warm bowl of soup or a jacket potato was very welcome at lunchtime. I always used to make extra if I made a stew or chilli and freeze in portions it was then easy to take to work and I know from experience that if I ventured out at lunchtime as I hadn’t bought anything in with me it was over to Marks & Spencer who do the most divine sandwiches and of course all their yummy sweet things are by the till…Do I need to say more??? Fried Fish with peppercorns in black bean sauce. 100 gm white fish cut into smallish pieces and rolled in rice flour. Heat up the oil in a wok and shallow fry fish quickly on each side until it becomes golden brown, it will take around 2 to 3 minutes on each side. In the same wok where fish is fried sauté garlic, chilli, onion and ginger. Add green onion and peppercorns then stir-fry for a minute. Then add fish. Add splash water, black bean sauce bring to a rolling boil, add fish and turn over once to coat with the sauce and simmer for 2 mins. If the sauce is thin you can add a bit of cornstarch/arrowroot slurry to thicken it. You could also make this at home and heat gently at work for lunch or microwave it. Jacket Potatoes…Easy to do and will fill you up…If you have an oven at work then in your pop one in the oven and take a portion of chilli, baked beans, cheese, coleslaw, sweetcorn, caramelised onions and mushrooms what is your favourite topping? My favourite is chilli be it a meat or vegetarian one or cheese and coleslaw if it isn’t too cold. NB. HELP! I would rather use dried kidney beans rather than tinned HOWEVER I soak them for hours then cook then add to my chilli and they are still not soft…I don’t have a pressure cooker but is there anyone who can give me some tips and I don’t add salt while soaking. It pleases me though because it means that he tastes the food and knows when it needs something else so that is good for a child. 2 lbs of mushrooms…mixed I used straw, button, crimini and some small ones which I can’t remember the name. Melt the butter and add the mushrooms and add a pinch of salt and cook until they give up their juices and reduce the heat. Cook stirring until the juice has evaporated and the mushrooms start to brown. Pick out a few nice pieces and set to one side for the garnish. Mix the onions into the mushrooms and cook until the onion softens about 5 minutes. Add the thyme and garlic and pour in the stock and water simmer for 1 hour. I hope this has given you a few ideas about what to have for lunch…What is your favourite lunch? I have added the link to a Chicken Noodle soup as it also has the recipe for homemade chicken broth. This entry was posted in Chicken Noodle Soup, Chilli Con Carne, No faddy diets just healthy food, No more diets!, No to food waste, Soup, Thai Pumpkin Soup, Uncategorized and tagged blogging, Chicken stock, Lunches on the go, Made from Scratch, No more diets!, Soups, Stir fries on November 20, 2018 by CarolCooks2. Monday saw me posting about What is Processed Food? Thursdays are now my Waste not! Want Not! days and it has morphed into something much bigger and for sure I am learning much but also pleasantly surprised at what many of you already do..So a big well done…Give yourselves a pat on the back! It is when I see beaches with all that rubbish it breaks my heart I mean how can little children play on that sand? If that is on the beach what is in the sea and poisoning the marine life? This entry was posted in Cooking from scratch, Healthy Eating, No faddy diets just healthy food, Retired No One Told Me! 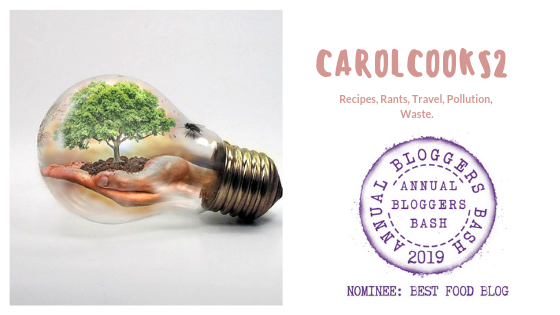 Weekly roundup!, Sally at Smorgasbord Health 2018, Uncategorized and tagged Eat Smart, Recipes, Soups, Stir fries, Tips, Waste not want not on November 11, 2018 by CarolCooks2.